This story was passed on to us from Marcelle Thomas, Title I Parent Coordinator and School Improvement Specialist for Durham Public Schools. She meets kids like Sarah every day, and helps make sure they have enough to eat during the school year. But summertime is a challenge for the schools as their cafeterias close and kids go home for three months. Over half of all the children across central and eastern North Carolina depend on the meals provided by their school as their primary source of food. For these kids, the breakfast served in their classroom and the free meal at lunchtime are a lifeline. 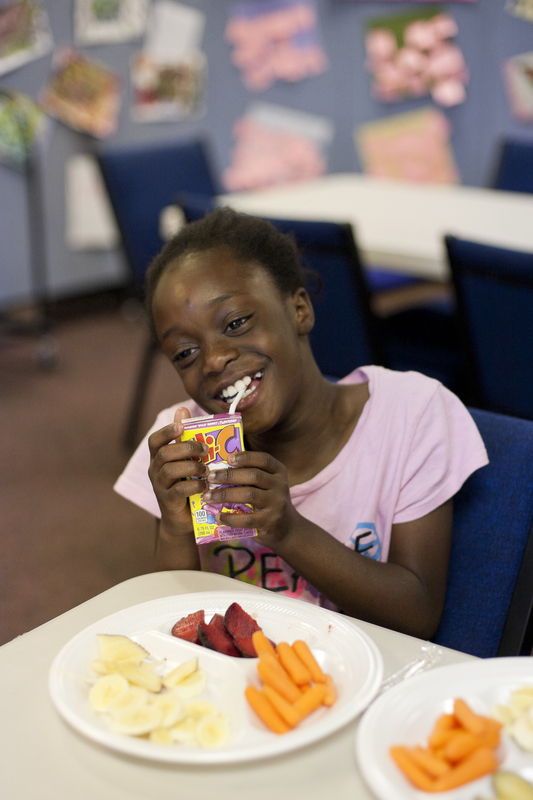 One of the ways the Food Bank helps ensure these children have enough healthy food to eat while they are out of school is by sponsoring the USDA’s Summer Food Service Program, or as we call it, the Kids Summer Meals (KSM) Program. The Food Bank is the largest non-government sponsor of the program in North Carolina. This summer, we hope to feed thousands of at 160 sites across our service area. We are excited to partner with local restaurants and catering companies to provide more hot meals to more kids. We also have a strong focus on nutrition, and will provide fresh fruit, low-fat milk, and healthy snacks to our sites. For many of us, summertime means family vacations and cookouts with friends and neighbors. But imagine instead of trying to decide where to go on your trip, you had to decide between putting gas in your car to go to work or feeding your child a full, healthy meal. Or instead of running to the store to pick up groceries for a barbecue, you had to stand in line at a food pantry because your food budget didn’t stretch far enough that month. Your donation can make an impact on a child’s life this summer. By supporting the Food Bank, you make it possible for us to provide meals to children and their families during a time of increased need. For every dollar donated, we can provide five meals. Contribute to our Stop Summer Hunger food and funds drive today!